Brooklyn Bacon Takedown Update: I Will Win Next Year!!!!! Yes, dear Friends and Readers: I made an Maple-Candied Bacon and Ancho Chili-Spiced Roasted Pecans in Bourbon-Maple Nougat with a touch of Sea Salt and I lost! But I had a great time and met tons of people. Here’s to next year’s Bacon Takedown, and to beating the pants off my new friends! Next Bacon Takedown, fly to New York! Could use the vote! There may be a possibility for that 🙂 Stay tuned! Wow looks like you had LOTS of fun! Hey Dr. Bacon! Please let me know next time you are competing – I will come and cheer you on! Your recipes sound amazing! Thank you! There is a Mac and Cheese Takedown after the New Year. Will let you know! Hopefully you can come out! I wish! I would love to do a horseradish Gruyère and ham, but a little birdy told me that there is a disproportionate number of vegetarians that attend the Mac and Cheese event. When the time comes, I may be bouncing ideas off you! I was a vegetarian for years too, but I couldn’t stay away from bacon and sausage 🙂 I think if we join forces, it will be devastating for the opposition 😉 Bwahahahahaha! Recipe? Did I hear the word “recipe”? You have to insert a warning at the top of the recipe though. Warning: May cause insatiable need for more nougats. The sample that you sent us was so good. We blew thru them in a matter of seconds. Thank goodness you only sent a handful. We would have eaten a boat load. I can’t believe I’m excited about nougats. I had written them off for so long. Those nougats were winners in my book! They converted me! So glad to hear! I will be making another batch soon to photograph for my friend’s website. I’ll have more to send out to people then. All my peeps in Europe missed out because I was a little slow getting organized post-Takedown. I was worried that they wouldn’t arrive in good shape. To be rectified soon! Hopefully I’ll have a fresh batch when you come to visit! That sounds like an awesome deal! I’ll bring the pig candy! Omnomnomnomnom! Can’t wait 🙂 How many more sleeps? As if I would be counting, but it’s 95 sleeps til we leave, and 146 sleeps til our ship arrives in NY! Whoo hoo! You will be here before we know it! It is going to be delicious fun! You were robbed! Looking forward to the recipe. Sigh. I was disappointed. But the guy who won was so sweet it was hard to be sad! Yes! Recipe please! Now you know what it takes to win. You will be successful! Sounds like a fun day. I wish I had to help judge. Me too! I could have used your vote! I love the photos! I can attest that yours was rightfully the winning recipe. 🙂 What are you planning for next year? Thank you, Emmy! I am planning the trashiest thing possible. Those bacon-Velveeta éclairs might actually materialize! Leave the gun! 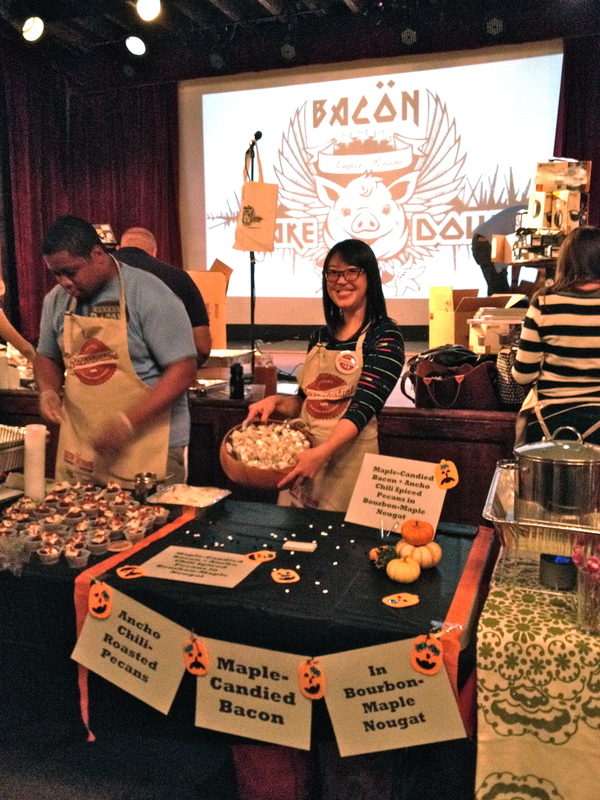 Take the bacon candies! I’ve never heard of anything quite like that! Sounds amazing but what does it taste like? Can you sell it? It tasted AWESOME. Like smooshy clouds of bourbon praline astronaut ice cream studded with bacon! It will *likely* be for sale on my friend’s website. More details forthcoming! What a fun day and it all looks yummy! Thank you! Unfortunately, I didn’t get to taste everyone’s dish. One of the drawbacks to competing! But it all smelled like glorious bacon! smelled like glorious bacon is one of my favorite things to smell like. Right? Me too! I wonder if there has ever been a ham or bacon note in perfumery . . .
now I have to look that one up!! Better luck next year…I think you are still a winner no matter what the judges thought. I forgot to tell you, my 2 year old son was tossing and turning, he was obviously having a bad dream. He woke up in the middle of the night opened his eyes and yelled, “I want bacon!” I am a good mother. Oh la la ! How come you didn’t win?! Thanks for the comment! I was disappointed too, but there is always next year!